eZAKKA Garden Labels Tags has smooth surface,high touhness and corrosion resistance,wear resistant,easy to write and so on. The thickness of the standard,so that the product more perfect,the appropriate thickness,more durable,with long servive life. These plastic plant tags are waterproof and will not brittle and snap like most plastic tags. They will not rot as wooden tags do either. A variety of color products,to meet the different needs of you. Best of all they are short enough to fit in a mini green house or humidity dome. UV Resistant makes the label last as long as possible. The "Matte Finish" makes the labels easy to write on with a permanent marker or a pencil on either side. QUALITY --- eZAKKA plastic plant labels made of PVC plastic.Durable,after the expansion is still distorted Not Bad.UV resistant,waterproof and will not brittle and snap like most plastic tags.Unaffected by weather (bright sun, high heat) and are working great to label the multiple rows in your botanical garden. EASY TO WRITE --- The "Matte Finish" makes the labels easy to write on with a permanent marker or a pencil on either side. 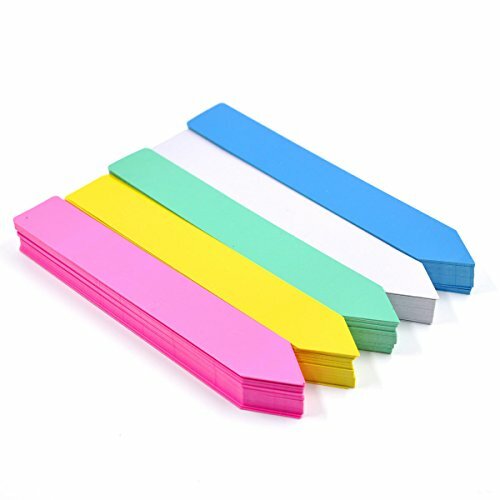 CONVENIENT TO USE --- 5 different colors to identify different plants.Easy to stick it in the soil.Good for marking seed trays, pots or attaching to young plants. EASY TO CLEAN --- Easily cleaned with household cleaner, reusable.